Cretan Folk Art is a fine example of how such creative arts are deeply embedded in the culture, heart and soul of Greece and her islands. None epitomises this culture of creativity more than the Greek Island of Crete. A rich tapestry of influences drawing threads from the Minoan civilization, the Roman and Byzantine Empires, the Venetians and the Turks have been interwoven into the existing wealth of creative expertise passed down from ancient times. 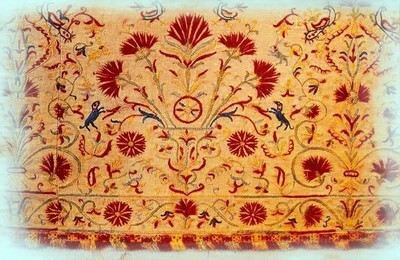 Cretan embroidery is noted for its exquisite variety of colour, symbolism and varying techniques. The most notable classic techniques of Cretan embroidery are grafta, which involves patterns drawn freehand onto the fabric, and Metrita-xombliasta, made by counting the threads in the fabric. Both these techniques and others are employed to create exquisite embroidered pieces. Many embroidered pieces such as church decorations, pillows, valances and hems, are drawn from the Byzantine tradition. They feature decorative motifs with complex floral designs, mermaids, double-headed eagles, snakes, winged snakes, animals, birds of Crete, and female figures at prayer. Many 20th century framed embroideries or decorations feature proverbs or figures drawn from history or the mythology of ancient Crete. Lace making in the Greek islands can be traced back to ancient times, practised by women of ancient Crete. It was reintroduced to the Crete villages from the West during the Renaissance. Some lace work, such as krossia (tassels) and desies (ties) are made using the hands alone. Other types of lace work are made with small tools, such as shuttles, sock needles, smaller lace needles or bobbins. Examples of this form of Crete art can be seen in the home and in traditional costume, and are used to decorate weavings and embroideries. Of particular note is the kopaneli in Cretan Folk Art, which dates from the Byzantine times. The kopaneli is the name of the technical interweaving of many silk threads on a vertical layout that are rolled around 14 narrow and long wood sticks that are called kopanelia. 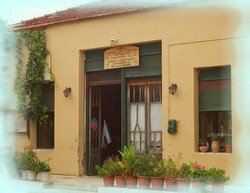 Examples of this particular creative craft can be viewed at the small but excellent folklore museum of the village of Gavalohori, West Crete. The mulberry trees planted around the village by the Turks still produce silk from the silkworms that feed on their leaves. The local Women’s Co-operative is actively reviving traditional handicrafts, examples of which can be bought in their shop on the village square. 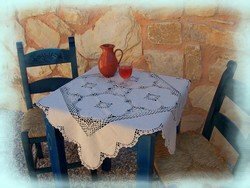 Crete culture and tradition show that weaving is one of the oldest crafts of the Island, and is an importnat element of historical Cretan Folk Art. 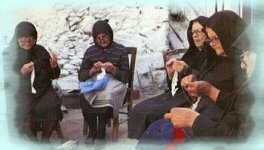 At work on the telaro or argastir (loom), women wove the family's clothes and cloth for use in their Cretan homes. The raw materials were wool, flax, silk and cotton, which in many cases they themselves had produced, processed and dyed. Cretan weavings are characterised both by richness of colour and the arrangement of decorative designs into bands. The oldest and most common designs are geometrical, featuring variations and combinations of the rhombus as their basic motif. Other common patterns involve stylised floral and animal motifs, human figures and scenes inspired by religion or the history of Crete. Just ask at a tourist information office for location and opening times.